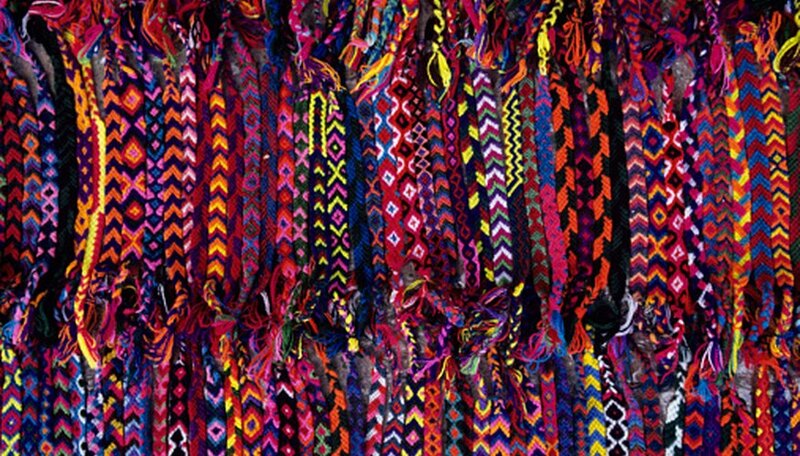 Handmade bracelets are very popular and can be made from many different materials, including raffia, ribbon and yarn. Yarn is the most common of those materials, because it is durable and comes in a great variety of colors. The bracelets can be made by using a pre-made loom or using one's fingers to weave the material. Hold the three pieces of yarn in your hand and fold so that one side is about 2 inches longer than the other. Loop the longer side over your index finger and hold the shorter side with your ring and little fingers of the same hand. Braid the three strings using the thumb and middle finger of the hand holding the yarn and your free hand. Make it about 1-1/2 inches long. Tie the extra piece of string around your leg. This will be your loom support. Pass the braided section under the string on your leg, fold the braided section in half. This is to create the loop to tie the bracelet on the wrist. You should now have six strings to loom. Take five of the strings with the palm of your hand facing up. Take string one and pass it on the outer side of your thumb, string two in between your thumb and index finger, string three between index and middle finger, string four between middle and ring finger and string five between ring and little finger. Make a fist holding tightly to the strings. String six should be loose and closest to your little finger. Take string six and loop it over and under string five, making a simple knot, then over and under strings four, three two and one. Then reposition the yarn in your fingers so that No. 6 now becomes one and the rest scoot one over. The string that used to be No. 5 is now No. 6, and should be loose at the end by your little finger. Repeat the process until your loom is long enough to go around the wrist of the person who is going to wear it. Separate the strings and make two separate braids with the remainder of the yarn. Make a tight knot at the end of the braids and cut the fringe to make them even. Place the bracelet around the wrist and pass one of the end braids through the braided loop and tie it to the other braid with a pretty bow. The thickness of the yarn will determine the thickness of the bracelet. Plan ahead if you want to create a pattern. Stick to one kind of yarn for each bracelet. Depending on the kind of yarn, color may bleed when washed or wet. It is better to have extra yarn than to not have enough. Ana Estrella began writing curriculum for San Diego City Schools in 1999. She holds a Bachelor of Arts in liberal studies, a Bachelor of Science in Spanish literature, a Bilingual Teacher Credential and a master's degree in science education development—all from San Diego State University.